Multigems globe will bring you improved relationships to enhance your career. The globe would energize your mentor luck, business luck, networking, literary pursuits and recognition luck. In today's environment, knowledge is equivalent to success. All kinds of work involves some sort of knowledge, literature, skills and information. And to excel in our work, we ought to have literary luck to always stay at the forefront of competition. 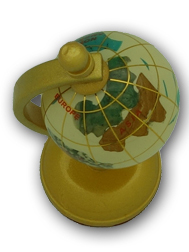 To crystallize such luck for both working people and students, display this globe at your desk. 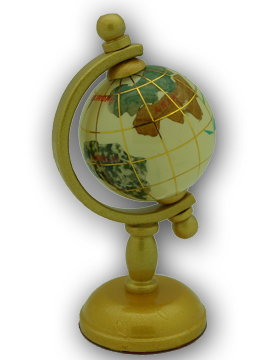 The globe is made from natural white jasper and multiple gemstones with a gold finished brass base. Note: There are many qualities of multigems globes in the market, and ours are being sourced from the most expensive of all qualities. The factory we ordered from only makes globes of export quality. What Gem/Crystal Globe symbolizes and how to place this object? Crystal/multigems globes are excellent energizers for academic pursuits and promoting interest in studies. Globes also resemble wisdom, intelligence, smoothness in endeavours and expanded network. Most tycoons, rich people, highly literate people, judges, lawyers and politicians would place a globe on their desks. Globes also bring fame and recognition besides bringing in confidence in people. They are also potent energizer to enhance mentor luck. For businessmen, the globe would secure sales going global. Many logos of firms and successful company uses a globe to signify this. Earth energy in globes are important for potency. Crystal globes are made from glass with lead oxide to ensure potency for Feng Shui use. On the other hand, multigems globes are made from gems that are dugged deep under the earth is extremely important to bring out earth energy in globes also. If you cannot decide which one to get, then try to get both if affordable. 5. One can also display the globe in the location where the natal Flying Star #4 or annual Flying Star #4 is. The natal flying star will be determined by one's own natal flying star chart of the home. While the annual Flying Star #4 location can be found in our annual flying star analysis.